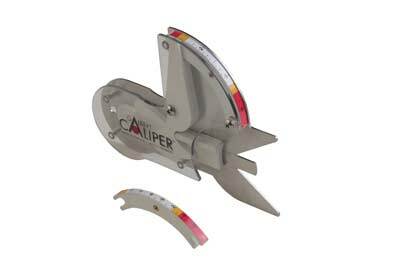 Measuring any spindle at multiple places for varying specific diameters can be a real pain and one needs many callipers of different sizes - even open-ended spanners can be used - but what if there was one tool that could handle diameters of 70mm (2 3/4in) down to 12mm (1/2in)? Well, the Galbert Calliper is just that tool. To use, you simply stop cutting when you reach the desired diameter. There is no need to set multiple tools and use them in the correct locations. Quite simply it is a spring-loaded pin that is connected to a measuring scale that you slide over the work as you cut - this allows you to see what diameter the item is at any given point. Yes, you have to hold the tool at the back of the work and yes, there are safety implications in that - no loose clothing and the possibility of getting caught in the chuck or spindle. Of course, you can check with the lathe turned off - 0 is the safest option - but in truth, most spindle turners check when the work is still running. The sections that touch the work - the spring-loaded pin and the 'V' section which slides onto the work so that the pin is centralised - are made from stainless steel for long life and the measurement slide is available in metric or imperial. 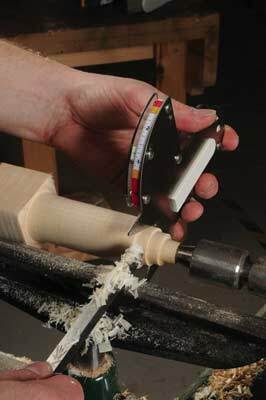 It would make a great present for a spindle turner as it does make life so much easier. It really is that simple. Of course, you can cut too deep - it doesn't take away human error - but it does make measuring so much simpler. It really is a simple device and one wonders why anyone hasn't thought of it before. It is a wonderful device that does exactly what it says on the box.